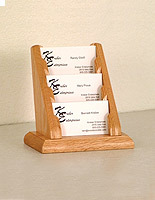 These medium oak business card holders are great for dispensing promotional information because they feature a compact design. 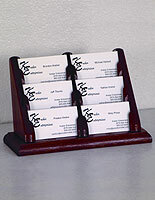 The organizers are made for countertop placement and have (3) pockets for holding up to (90) cards total. 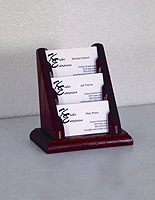 The business card holders make great office supplies in a variety of locations such as car dealerships, law firms, insurance outlets and travel agencies. 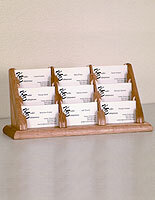 The countertop organizers are made to display promotional info in a horizontal orientation. 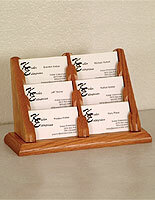 Each of the card holders is made of real, solid wood and has an attractive finish that complements any environment. 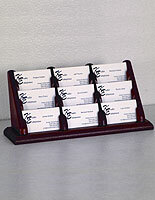 The office supplies are excellent for lobbies because they can hold contact info for a number of employees. 5.8" x 5.8" x 4.4"